Expert technicians get expert results with SaniTech’s comprehensive cleaning process. PRE-WORK PREP Hot pre-spray loosens the soil and breaks down spots. 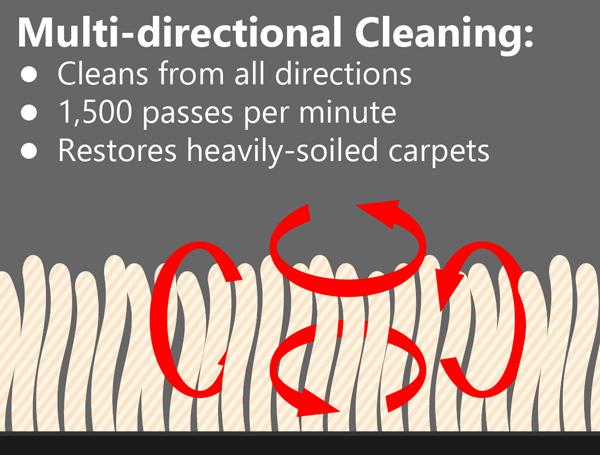 MULTI-DIRECTIONAL CLEANING A thorough cleaning and rinsing of the fiber from all directions. SPOT & STAIN REMOVAL Technical know-how and top quality cleaning products can resolve difficult challenges: coffee & wine spills, pet stains, etc. GREEN philosophy. Non-toxic, bio-degradable, odorless PROCYON® is used in all of the pre-treament and clean-rinse processes. TIME to ensure perfect results. A comprehensive cleaning process produces fresh, odor-free fabrics, and powerful equipment shortens drying time. FINISHING TOUCHES yield pristine results. A clean, soft-water rinse and a final grooming process leaves fibers exceptionally sanitary, soft, and fluffy.